I watched the movie, LINCOLN, tonight. Not sure where the writers would place the setting within his life and history. I watched in complete awe. ONE OF THE BEST MOVIES I HAVE EVER WATCHED. 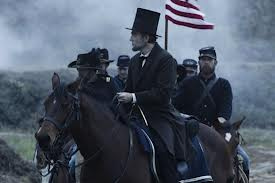 I watched as Lincoln walked with the people, not afraid to roll up his sleeves and work with the people. His sweat was real, his worries for the whole of mankind. What has happened to our values as a country since that day? When was the last time a President worked along side his fellow man or Held the dead in his arms? Our leaders seem so plastic, so recorded, so removed. Like a made up superhero. No wonder our country is in so much trouble. The love has been removed. In my opinion, this is the repercussion of taking God out of everything. Forcing our country into a neutral uncaring AMERICA! We wonder why our world seems to be dying. Like infants we watch the stories come over the news telling of wars, deaths, explosions, gunmen in schools, etc. Then we brush it off like a bad video game and move on, pretending it doesnt affect us. We cannot hide from ourselves. Cause and affect, karma, will see to that. What ye sow so shall ye reap. We, as a country, have brought on what we now fear. We have become weak unto ourselves. Afraid to stand for the rights and freedom our forefathers died for. If our presidents represents us. What a sad state we are in. FIRST TIME, SHAME ON THE PRESIDENT, SECOND TIME….MAYYBE!!!! THIRD TIME, S-H-A-M-E O-N U-S!!! ← ANYONE KNOW WHO PAINTED THIS OR WHERE I CAN BUY THIS?